Open to ALL RICE undergraduate and graduate students!! Work with students from other institutions! WIN PRIZES! The INNOVATE Design-a-Thon is an engineering design competition similar to the traditional code-based hackathon. Teams of 3-5 students will compete to design, prototype and present the best device in categories to solve a real world problem in disabilities. Each student team will have the duration of the Design-a-Thon and the physical and human resources of the OEDK to develop their solution over the course of the weekend. This year's focus will be developing assistive devices for adults and children with disabilities. REGISTER TODAY!! Limited spots available! Students will listen to expert panelist discuss challenges in the area of assistive devices for adults and children with disabilities. Together with their team and advising mentors, a challenge will be defined. Students will take the defined challenge and use the foundation of design cycles to develop solutions to the challenge. Drawings and low-fidelity prototyping will be used to bring their ideas to fruition. Students will use the expertise and tools in the OEDK to build a working prototype to provide a solution for the challenge. Mentors will be available for advice and direction. Students will use coaching to develop a presentation to present to a panel of judges. A rubric will be used to score the prototype and the presentation. Friday night, September 1st - teams gather for dinner to explore and identify challenge for the weekend. Teams will hear from experts and possibly potential clients. Panelists and some Mentors required, Other Mentors and Judges encouraged to attend. Saturday all day, September 2nd - teams work to design and develop prototypes of their concepts; get guidance from mentors. Mentors required at designated times. Sunday day, September 3rd- teams finalize their prototypes, get presentation coaching and present to a panel of judges for a cash prize. Judges required, Mentors and Panelists encouraged to attend. The competition is open to Rice University undergraduate and graduate students, as well as invited students from various medical institutions nearby. All team members must be present and actively participating during the entire duration of the competition. If one or more team members is absent then teams may have to forfeit and team members may be assigned to other teams. All students MUST review the safety materials and watch the OEDK Safety Video prior to prototyping in the OEDK. These will be presented on the Saturday morning portion of the competition. Taking the safety quiz and applying for official OEDK access is not required to gain access to the OEDK for this event. Students may NOT bring any materials, supplies, equipment etc. to the competition. Computers with engineering software will be available to all teams. Personal laptops WILL be permitted and MAY be brought into the OEDK to be used during the duration of the competition. Entire prototype MUST be built using only materials, supplies and equipment available in the OEDK. The materials and supplies will be openly available to the teams to use at no cost. No teams or students will be required or allowed to buy any materials and supplies using personal funds. Be mindful of the limited stock of materials and supplies. Try to only take what you need and return unused items when it is determined it is not needed. Be mindful of time on the limited OEDK equipment. Only begin using the equipment when the file/part design is complete and ready to be executed. All participants must respect the instructions of the competition staff, faculty, lab assistants, volunteers and especially technicians. These leaders should be easy to identify. RULES ARE A WORK IN PROGRESS. MORE SPECIFIC RULES MAY BE ADDED AS THE COMPETITION IS DEVELOPED. Any questions, please contact the OEDK at oedk@rice.edu. Teams will consist of 3-5 undergraduate or graduate students. ALL participants must register by the deadline prior to the event. Teams will be assigned randomly and assigned during the Friday dinner. Judges will score each team. Overall average wins top prize. Teams are only eligible to receive one of the 3 prizes. If a team scores highest in more than one category, they will receive the highest prize available and any other prizes will go to the team(s) with next highest score. In the event of a tie, the judges will consult each other and decide between the tied teams, which one will be the winner for each prize. Judges enter the scores themselves as each team competes using their own device or one provided for them. Someone is assigned to sit with the judge and enter the score as each team competes. Judges enter the scores on paper and someone enters the scores at the end of the competition. Visitor parking will be available is available in the North Lot*. This is the parking lot directly across from the OEDK front doors, which is near Entrance 21. 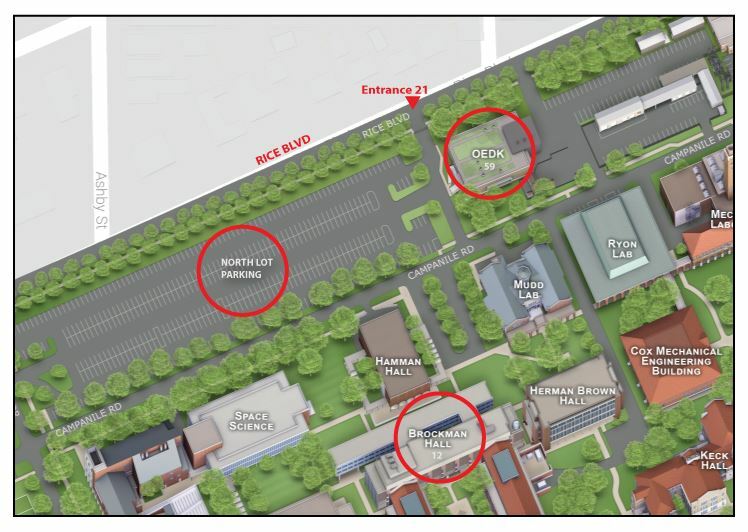 The parking lot entrance is located on the right, after you enter Entrance 21 off of Rice Blvd. You will need a credit card to enter the visitor lot. We will have parking validations available. Parking validation instructions: Upon leaving the event, insert the parking validation first, and then the same credit card that was used to enter the parking lot. This will credit your card for the parking charge and release the gate. *(Signs may say it is visitor parking only for specific times, but we made arrangements for it to be visitor parking for the whole event). Click image to enlarge - Click HERE to print the location map.